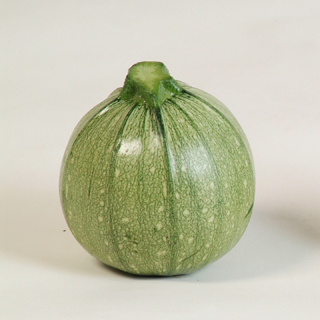 This easy-to-grow ball-shaped zucchini lends itself to creative fun in the kitchen - grill, slice or hollow out and stuff. Attractive foliage is mottled with green flecks creating a beautiful compact plant that is more manageable than othe rzucchini. Adapts well to patio containers. Multiple disease resistances. 45 days. 3 - 5" fruit. Round ball-shape I 2.4"-3.1" x 2.4"-3.1"